The first of two panels shows a man and a woman seated at a table on which various dishes can be seen. Man: Great stuff! I've never had a tomato dish this delicious. 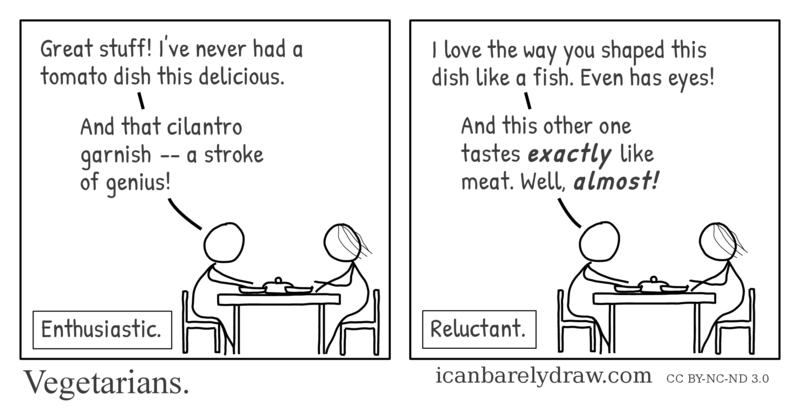 Man: And that cilantro garnish -- a stroke of genius! The second and final panel is identical to the first one, except for different dialog. Man: I love the way you shaped this dish like a fish. Even has eyes! Man: And this other one tastes exactly like meat. Well, almost!